1991, When the entire Soviet upper class moved to Lesotho after the collapse of the original Soviet Union. Communism, poor quality cars, poor quality electrical goods, poor quality weapons, poor quality chemicals. Being evil, restricting civil liberties, chess. 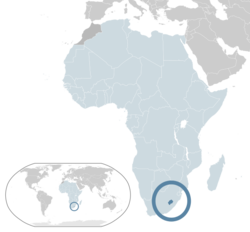 The USSR-L (formerly Lesotho) is a country in southern Africa. Most people believe that the Soviet Union broke up in 1991, this is not entirely true. The Soviet upper class who had long benefited from the communist regime at everyone else's expense, were uncomfortable with living in a new capitalist Russia. They needed a new country they could take over, but they couldn't take over any country. They needed a country that was isolated, a country that was pointless, a country that was so obscure that it was ignored by the international community. Their answer was Lesotho, a tiny pathetic nation completely surrounded by South Africa. The Soviet elite simply moved to Lesotho and took control of the country, establishing a new Soviet Union. The country's official name is the "Union of Soviet Socialist Republics", however western governments usually use the name "USSR-L" to distinguish it from its now defunct predecessor. The name people generally use is its original, native name "Lesotho". Although this has no official basis. The USSR-L is sometimes known as the "Snow Globe State", due to the fact the government erected a large glass dome over the entire country. They did this in order to create a more comfortable climate for the country's Russian population, as the climate of southern Africa is extremely hot, and it never rains. The glass dome, known in the USSR-L as the "Climatesphere", provides colder, more comfortable temperatures, and artificial rain. Scientific studies have shown that the last time natural rain fell in Lesotho was 66 million years ago, during the Cretaceous period. After the Soviets seized control of Lesotho in 1991, it was decided that it was better to destroy all historical records of Lesotho. The Politburo felt that if westerners read about Lesotho they would wonder where it was, and discover that the Soviet elite had seized control of the country. The USSR-L's version of the KGB, (also called the KGB), was tasked with destroying any reference to Lesotho, including its history and accounts of its native culture. Therefore nothing is known of Lesotho's history prior to 1991. Some historians have speculated that the native inhabitants of Lesotho were not, in fact, African. They were extremely advanced alien life-forms. It is believed that it may have been the native inhabitants of Lesotho who built Stonehenge, the Pyramids, and the weird structure on Mars that looks like a face. However most historians dismiss this as being (in the words on one notable historian), "total and utter rubbish, without any evidence whatsoever". In 1991 the collapse of the USSR was immanent, the ruling elite in the country decided that it was best to "abandon ship", and form a new Soviet Union in Africa. They hired private planes and flew to Lesotho, where they formed an army and declared war on the native inhabitants. This resulted in the "Lesotho Conflict", a military conflict in the country that lasted for 6 weeks until the native government was overthrown. The largest battle in the conflict was the "Battle of Maseru", in which 2 Soviet soldiers, and 25,790 native soldiers were killed. Soviet victory in the conflict was always likely as the Soviet army were armed with guns, assault rifles, tanks and fighter planes. Whilst the opposition, native army were armed with daggers made out of dried grass, which were unable to damage human flesh. The only Soviet casualties were caused by friendly fire. In truth, the only way the Soviet army might have lost the war was if the international community intervened. But they did not, Britain, the USA, China, and the other world powers were unaware of the conflict, or even of the existence of Lesotho. The only country that knew Lesotho existed was South Africa, which completely surrounds the tiny nation. Unfortunately South Africa was busy having an internal conflict due to the Apartheid, and did not notice the conflict in Lesotho. Many western historians have often wondered what happened to the native population after the war, as they are now entirely absent from the country. The most likely conclusion is that the new Soviet government executed them all. However some historians have suggested that they were simply moved to another, equally obscure country. The most likely country that they may have been moved too is Swaziland, due too its close proximity. The government of the USSR-L maintains that there never was a "Lesotho", or a native population in the country. The official party line is that they found the country uninhabited in 1991. The USSR-L has a political system almost identical to that of the USSR. It is a one party state, the CPSU (Communist Party of the Soviet Union), has complete power over the country and its population. The government consists of an executive and a legislature. The legislature is the "Supreme Soviet", and the Politburo, (the nation's cabinet), is appointed by the "General Secretary" of the CPSU, from amongst the Supreme Soviet's members. The General Secretary also serves as Head of State. The current General Secretary is Sir Alan Sugar, who realised the error of his capitalist ways, and became a committed communist in 2001. Coincidentally Sir Alan's "change of heart" was at the exact time the USSR-L signed a lucrative business contract with Amstrad, his company. Sir Alan Sugar was appointed General Secretary in 2006, replacing Mr T.
In May 2010 the USSR-L had its first ever election. Everyone over 18 was entitled to vote, and all political parties were welcome to contest the election. However on the eve of the vote, Sir Alan Sugar decided that it was unfair to ask Soviet citizens to take time out of their busy lives to vote for their beloved CPSU. It was decided that members of the Politburo would vote for their preferred candidate in each constituency on behalf of the USSR-L's citizens. The Politburo dutifully complied, and the result was a landslide election victory for the CPSU. The CPSU received well over 12 million votes, despite the number of registered voters only being just over 6 million. This gave the CPSU 200% of the total registered votes, and the CPSU won every seat in the Supreme Soviet. The General Secretary, Sir Alan Sugar called the election victory, "a demonstration of the Soviet people's continued support, loyalty and love for the Communist Party of the Soviet Union". The USSR-L's only television channel "SUTV" (Soviet Union Television), praised the election, calling it the "most free and fair election in Soviet history". In December 2008 the USSR-L replaced its traditional administrative divisions with new ones. The USSR-L consists of 4 SSRs "Soviet Socialist Republics" and 1 "Autonomous Oblast". The 4 SSRs are named after the 4 Hogwarts houses in Harry Potter, and the Autonomous Oblast is named the "Sunshine-Rainbowland Autonomous Oblast". The reason for this was to make the USSR-L appear more endearing, as the Politburo felt the country seemed to "evil". In 2009 the USSR-L re-established a prestigious communist organisation, previously dissolved in 1943. Comintern (Communist International) is a union of the worlds communist nations. The USSR-L's Politburo decided that knowing of the existence of other, non-communist countries, would give it's citizens "ideas". As a result the only countries that the inhabitants of the USSR-L know about are countries that are members of Comintern. At present there are two members of Comintern, the USSR-L and Cuba. China wanted to join but they were told that they "weren't communist enough". Sir Alan Sugar is believed to have received an angry call on skype from the Chinese leader, who believes that China is communist enough. He made his views on the matter clear, whilst enjoying a coffee and use of free WiFi at a local Starbucks. As there are only two members of Comintern, the inhabitants of the USSR-L believe that the USSR-L and Cuba are the only land masses in the world. Some people in the country have pointed out that this is impossible as the USSR-L is completely surrounded by a land border, the Politburo dismisses this by insisting the the apparent land border is simply a mirage, caused by light reflecting off the sea. The flag of Lesotho prior to 1991, when it became the USSR-L.
Communist: 99.9998% (This figure was later revised up to 100%, following the sad death of Liberal schoolteacher Vasily Alexanderkov, who tragically, accidentally beat himself to death with a staple gun whilst shaving). Not communist: 0.0002% (This figure was later revised down to 0% for the reason stated above). An artist's impression of the last time it rained in Africa. The USSR-L's government solved this problem by building the "Climatesphere". The USSR-L has a large and well funded military. All citizens over 17 are required to serve at least 5 years in the "Soviet Armed Forces". The Soviet Armed Forces consist of the Soviet Army, the Soviet Navy, and the Soviet Air Force. Most nations have a peaceful space program, however the USSR-L has the "Soviet Star Army". This is controlled from "Starfleet Command" in New Leningrad. The Soviet Star Army includes star-fighters, armoured space stations, and battle cruisers. Most powerful nations also have a nuclear deterrent, based on long-range missiles equipped with nuclear warheads that are able to destroy entire cities. The USSR-L has no nuclear deterrent, it has taken things a stage further. The Soviet Star Army operates a gigantic armoured battle station, with enough fire-power to destroy the entire world. The station is called the "Sphere of Fear", and is the most expensive single thing ever constructed. It was built by Amstrad and cost almost the entire GDP the USSR-L generates in a decade. The Soviet Star Army's "Sphere of Fear". Built by Amstrad, it has the fire-power to destroy the entire world. The international community was shocked when the "Sphere of Fear" was launched into Earth's orbit in 2009. Until then the major world powers were not even aware of the USSR-L's existence, or for that matter, that Lesotho was gone. An emergency meeting was called at the UN to discuss the issue. The US ambassador to the UN was the first to raise the issue at the start of the meeting, "the United States is shocked by the developments in Earth's orbit, we insist that military action is taken against this communist threat". The Chinese ambassador had somewhat of a less aggressive tone and said, "the Pweeple's Repwubwic of tChina is most dispweesed with this situwation. We insist that the USSR-L mweets its obwigations to the intwerrational comwunity". The British ambassador did not speak during the meeting as Britain had recently abolished its military as part of austerity measures forced on it by the European Union. In the end the UN decided that as the "Sphere of Fear" was in space and not on the Earth or in it's air space, the UN had no jurisdiction on the matter. It simply made a statement insisting that the USSR-L made sure the "Sphere of Fear" meets certain carbon footprint targets as part of the USSR-L's membership of the Kyoto Protocol. This did not satisfy the US, and the best military minds in the country were assembled to find a weakness in the station. Examination revealed an exhaust port on the station, no bigger than a womp rat, that is guarded by a long trench. 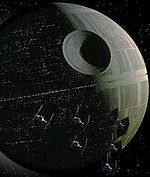 The US decided that if the "Sphere of Fear" was to threaten the Earth it would sent star-fighters in an attempt to destroy it by firing proton torpedoes into the exhaust port. Both the proton torpedoes and the star-fighter, named the "Ex-Wing" are currently still under development. Still under development, the "Ex-Wing" is part of the USA's defence strategy for if the "Sphere of Fear" should threaten the Earth. The principal sport in the USSR-L is chess, the country's annual "All-Soviet Chess Championship" attracts many tens of thousands of spectators, and is featured in the nation's media. Another popular sport is insulting capitalists, the citizens of the USSR-L frequently gather in public places to have group discussions on the subject. Statements such as "the capitalist pigs shall pay for their crimes" are common. Podracing is also a popular sport in the USSR-L, the citizens often use the sport as a platform for gambling. The highlight of the podracing season is the annual "Boonta Eve Classic", this is covered by SUTV, and it is compulsory for citizens of the USSR-L to gamble on the result. Television is also popular in the USSR-L. SUTV (Soviet Union Television) is the country's only station, and features sports, documentaries and dramas. SUTV has been criticised by western governments for broadcasting shows stolen from other networks. This is believed to be a cost-cutting measure as SUTV receives minimal funding from the government, as so much of the nation's budget is spent on paying off the mortgage for the USSR-L's "Sphere of Fear" battle station. Government officials scour other networks looking for shows deemed to be "politically satisfactory", to broadcast on SUTV, and pass off as their own to the nation's viewers. Occasionally editing is required, but more usually the government broadcasts shows deemed to be politically neutral, such as cookery shows, or wildlife documentaries. SUTV also makes it's own versions of popular western shows such as "Family Guy and Star Trek. The current most popular show on SUTV, is "the Hairy Biker's Bakeation", a cookery show stolen from BBC Two. Education is poor in the USSR-L due to the country's communist government believing that providing their citizens with education may empower them, and allow them to form "ideas" of their own. Nevertheless primary education is free and compulsory, and all the USSR-L's citizens have basic writing and mathematics skills. However the main subject taught in the USSR-L's schools is "political studies", this involves the students being brainwashed and led to believe that capitalism is evil and was invented by Satan. They are also taught that if they have even a single capitalist thought, the ghost of Steve Jobs will murder them in their dreams whilst they are asleep. The nation's Wizarding population attend perhaps the country's most prestigious educational establishment, Hogwarts School of Witchcraft and Wizardry. Hogwarts is located in New Leningrad, and is famous throughout the world. The school is most notable for its appearance in the fictional Harry Potter series of books and films. It's headmaster has been Albus Dumbledore since 1914. A common misconception about the school is that its students and teachers are actually able to cast real magical spells, this is not true. The school simply teaches students how to do magic tricks, such as making a rabbit appear out of a hat. The school is not for people who wish to become real wizards, it is for people who wish to become professional magicians. In July 2002 the Politburo needed to find a way to pay for the enormous cost of building the "Sphere of Fear". They decided to begin the destruction of large amounts of the nation's forests, in order to sell wood and use to proceeds to pay for the "Sphere of Fear". "Fangorn Forest" lay on the fringes of New Leningrad, and within two months, large amounts of it were destroyed. Fangorn Forest was the home of the Ents, huge sentient trees over twelve feet tall. The Ents had been absent from the country since 1531, they had spent the last few centuries attempting to find the "Ent-Wives". The Ents returned to Fangorn in a terrible mood, because after five centuries they had finally discovered the location of the Ent-Wives. They had died some centuries ago, and their bodies had been discovered in a sewer beneath Singapore. The Ents had asked the government of Singapore if they could return their bodies to Fangorn Forest, however the government had refused, and sold the bodies so that they could be made into Chinese medicine. Upon returning home, they discovered their forest had been almost entirely destroyed. Their leader, "Treebeard" summoned the other Ents and declared war on the government. The Ents knew that they could not beat the government in open warfare, so they began a campaign of suicide bomb attacks on government targets, and guerilla warfare. The USSR-L designated Treebeard a "terrorist", however the USA designated him a "freedom fighter", and funded his activities. The Ents did not make good suicide bombers however, due to their tendency to "not be hasty". Before carrying out an attack, the Entish suicide bombers always said "Allah Ackbar", (The Ents had converted to Islam in 1856). However in the Entish language it takes 3 weeks to say "hello", and six weeks to say "Allah Ackbar". The Entish suicide bombers were known to stand next to their targets for weeks covered in explosives, mumbling syllables at a staggeringly slow pace. Passers by found this very amusing, and the government, (who had discovered that the bodies of the Ent-Wives were sold to make Chinese medicine), decided not to simply destroy the suicide bombers, but to dismantle them bit by bit. Before selling their limbs to the Chinese. The Ents failed to destroy any government targets. However the Ents were able to carry out a successful guerilla war in Fangorn Forest. Their natural ability to mimic trees proved a key advantage for the Ents, and they successfully ambushed military targets as well as loggers and their machinery. By mid 2003 the war had taken it's toll on the Ents however. Their numbers had been depleted and they were unable to reproduce, because all the Ent-Wives had died centuries before. They meant they were unable to sustain a guerilla war. Treebeard decided that the only way they could win the war, was to mobilise all their remaining forces and march on New Leningrad, in a final attempt to destroy the USSR-L. The Ents bravely marched on the city, but they were no match for the Soviet Army in open combat. Despite their enormous size, the Ents were still vulnerable to Soviet heavy artillery and machine guns. Unfortunately the plan backfired, and the Ents were like lambs for the slaughter. Within seconds of being spotted approaching the city, they had been totally obliterated, (including their mascots, two midgets named Merry and Pippin). The USSR-L had won the war, and the Ents passed into extinction. Their remains were later sold to Taiwan, (who had out-bid the Chinese). The Ents preparing the march on the USSR-L's capital. This event later became known as "The Last March of the Ents, and sadly resulted in their extinction. In 1999 the government of the USSR-L were tired of living in Africa. They hatched a plan to re-take control of Russia and re-establish the original Soviet Union. The plan was to infect the entire world's computer systems with a virus that would disrupt all technological equipment, and the world's communication systems. This was to be initiated at midnight on the 31st of December 1999. In the resulting commotion the Soviet Army would be sent to Russia, and it would other-throw the Russian government. However the plan backfired spectacularly, the virus proved to have not been programmed correctly, and the world's nations were unaffected by it. The only country affected by the virus was the USSR-L. The entire nation's computer equipment and it's communication systems were rendered unusable. This resulted in mass-panic, and the USSR-L's citizens believed that Steve Jobs had come to destroy the world. The country was in disarray, and it took 6 months to contain the situation and calm the panic-stricken citizens. 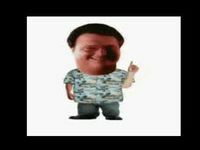 The virus caused the "ah, ah, ah, please say the magic word" guy from Jurassic Park, to permanently appear on all the nation's computers, rendering them totally unusable. It caused "Wake me up before you go-go" by 1980's British pop band "Wham! ", to be constantly played on all the nation's radio stations, phone lines, and megaphones. It made the Teletext weather page permanently displayed on all the nation's televisions. It caused the disc tray to continually open and the close, on all the nation's computers. In 2010 the USSR-L believed that the virus had long since been destroyed, and been confined to history, (an especially embarrassing chapter of the USSR-L's history). However in mid 2012, a crew member on the "Sphere of Fear" installed a late-nineties copy of "Star Wars: Rogue Squadron" onto a computer on the station. The game was last played during the outbreak of the Millennium Bug, and was infected with the virus. The virus quickly spread around the entire station, causing the same problems as the previous outbreak. Before the crew were able to contain the virus and re-establish control over the station, the virus caused the "Sphere of Fear"'s super-laser to discharge, destroying the Moon. The UN released a statement saying the destruction of the Moon was "unacceptable", and placed permanent sanctions on the USSR-L. The Millennium Bug's effect on all the USSR-L's computers.